For Christmas eve this year, we made the traditional Feast of the Seven Fishes dinner. Well, we had at least 5 types of seafood, but there was no way we could have 7 courses of food for just the 2.5 of us! We braved the craziness at YDFM for our seafood goodies today (holy moly, it was like the freaking apocalypse there). To start, we made Rao’s famous Seafood Salad. Gorgeous, light, and delicious! In addition, I made my easy-peasy version of shrimp scampi over angel hair. We eat it pretty regularly, but it’s too good not to include. A shot of my not-boozy cocktail. 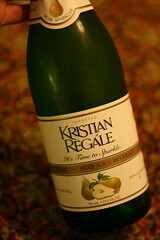 It’s a sparkling pear juice, and it’s surprisingly good and available at your local IKEA. Yeah, yeah, but it’s all I’ve got until this baby shows up! And tomorrow, we get to indulge in even more Italian goodies over at the in-laws. Mangia and Merry Christmas! 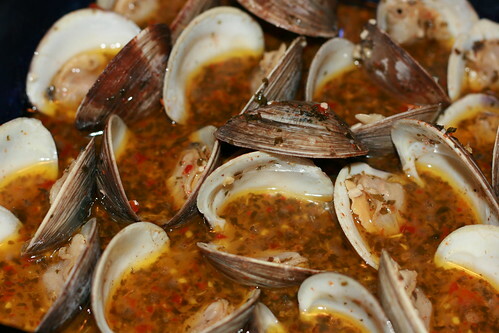 You are currently reading Feast of the Seven Five Fishes at mingaling.